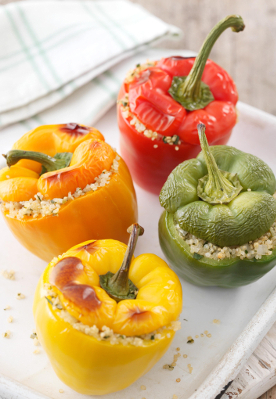 Stuffing fresh peppers with a savoury quinoa mix makes a colourful and nutritious meal. This recipe is gluten-free, dairy-free, vegetarian and vegan. 1. Preheat the oven to 220°C/Fan 200°C/425°F/Gas Mark 7. Place the quinoa in a fine sieve and rinse well in cold water then leave to drain. Peel and chop the onion. Peel and crush the garlic. Half and de-seed the chilli and discard the seeds, finely chop the flesh. 2. Warm the oil in a medium pan, add the onion and fry over a medium heat for four minutes until soft. Add the garlic and chilli and fry for a further minute. 3. Tip the quinoa from the sieve into the pan, add the water or stock and stir. Cover with a lid and bring to the boil. Reduce the heat to low and cook for 15 minutes. 4. Whilst the quinoa cooks, prepare the peppers: Cut off the tops of the peppers, and set these aside to form 'lids'. Scoop out and discard the seeds and pith from the centre of the peppers. Place upright in a baking tray. 5. Remove the quinoa from the heat. Add the coriander and lemon zest and juice and mix well. Season to taste with salt and pepper. Divide the mixture between the prepared peppers and place the 'lids' on top. 6. Bake for 35-40 minutes or until the peppers are tender and charred around the edges. Serve hot or warm with salad. Recipe courtesy of Doves Farm. For other tasty and inspiring recipes using teff and quinoa grain, look on back of pack or visit www.dovesfarm.co.uk/recipes/gourmet-recipes/ where both products are also available to buy.